The landscape outside the entranceway to the Alberta Temple in Cardston, Southern Alberta is kept perfectly manicured at all times. The Alberta Temple is one of the most magnificent structures of church architecture that you will find throughout Cardston in Southern Alberta, Canada. 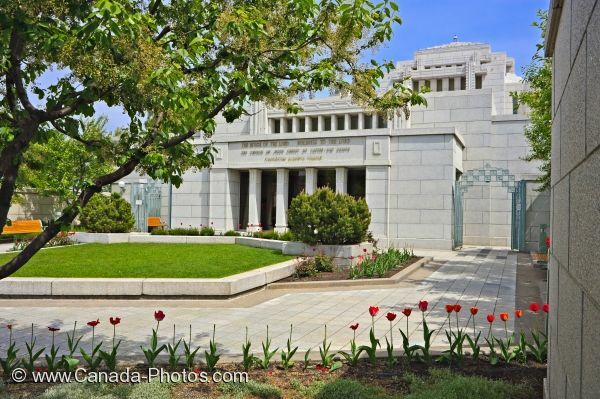 Tulips flourish in the well kept gardens, the grass and trees are trimmed to perfection which makes the landscape of the Alberta Temple flawless. Alberta Temple, Church of Jesus Christ Latter Day Saints, in Cardston, Southern Alberta, Alberta, Canada. Picture of the beautiful landscape inside the gates of the Alberta Temple in Cardston, Southern Alberta in Canada.